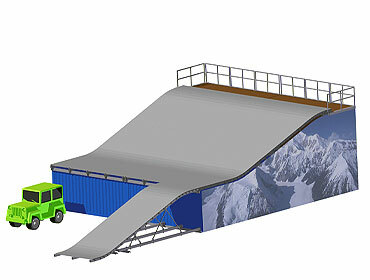 The Union Square Street Sessions rail jam was the event that started the creation of Stackbox Structures. It was the realization by co-founder Rory Strunk that there had to be a better way to build action sports ramps then the standard model of scaffolding and disposable wood decking. The napkin sketch was transformed by co-founder Eric Carlson into the vision of a “snap and go” system. The new history of Stack Box started on the streets of NY with an 18 foot high ramp and one year later grew to a 90 foot high Snowboard hip jump with the only adjustable ramp system in the world.